The Kirk of the Greyfriars was the first new church after the Reformation. It was built in 1620. The Greyfriars Kirk in Edinburgh is found on the site of an ancient Grey Friars Monastery. Greyfriars is one of of Edinburgh's most famous kirkyards. The Greyfriars Kirk in Edinburgh has been witness to many a historic event. The National Covenant was drawn up here in 1638. In 1679, some 1200 Covenanters were imprisoned in Greyfriars Kirk yard pending trial. This Covenant was retaliation against the Anglicization of the Presbyterian Church. In the Kirk yard, lie the remains of many distinguished Scots. The collection of 17th century monuments found here is among the finest in Scotland and one of the best in Britain. The Kirk yard is also the resting place of the poet Allan Ramsay, geologist James Hutton, historian William Robertson and also George Mackenzie, the prosecutor of the Covenanters. The Kirk has many interesting and fascinating stories for the visitors. Famous among them is the story of Greyfriars Bobby. The Skye terrier was a faithful dog that refused to leave the grave of his master, John Gray, upon his death. For many years, he watched over the grave and was fed regularly along with a shelter built nearby. 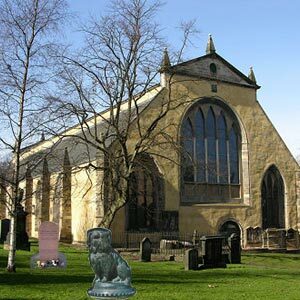 After his death, Bobby was also buried in Greyfriars and a bronze statue was sculpted for the small dog. You can see this just outside the Kirk gates.